digital as their primary method of banking. 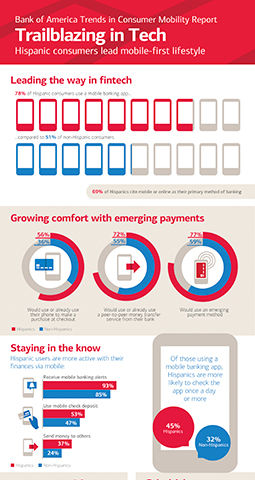 follows the bank’s recent introduction of its mobile app in Spanish. use their bank’s peer-to-peer payments service. balance (50 percent) and card charge overage alerts (48 percent). percent) as their preferred communications method. percent) the top places to do so. they take selfies, compared to 71 percent of non-Hispanics. say they use them in every text. by 48 percent over the past year. Access universal help button from all pages. Change or request new credit card PIN. Ability to lock and unlock debit cards. at a 95 percent confidence level.